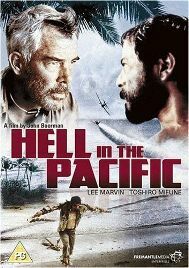 An American pilot and a Japanese officer are both marooned on a remote Pacific island. The Japanese man has become fairly self-sufficient – collecting drinking water and setting fishing traps, but the American views him as an enemy and destroys all these before realising that they have to work together the survive. The language barrier that the pair experience is also as the viewer sees everything – the film is nearly silent and the Japanese is not subtitled, which actually adds a level of interest. Lee Marvin is excellent as the twitchy US officer who slowly begins to trust his new neighbour and the film is more that a little funny at times, as well as very poignant. A pleasant surprise. This entry was posted in War Films, YearInFilm and tagged 1960s, 7/10, drama, dvd, usa. Bookmark the permalink.